I think most toddlers are quite picky when it comes to food, and it can be really difficult to find things that they actually want to eat. I know for our little tester this is most definitely a stage he is going through currently. I thought I would put together a list of snacks the little one eats at the moment and hopefully it might give you some inspiration, if you are going through the picky eating stage with your toddler as well. Dairy is a big part of a toddler’s diet, as it helps to promote the development of healthy bones and teeth. Cheese fingers or squares can be quite an easy on the go snack, as they are relatively mess free and easy for busy toddlers to eat. Malt loaf is quick and simple, and is one of the little ones most favourite snack. 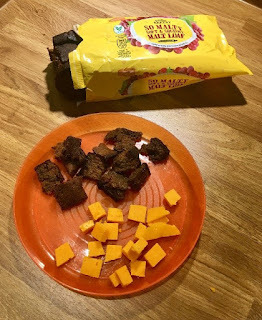 You can cut it up into little bitesize pieces and place it into a weaning pot, just to prevent a rogue piece of malt loaf sticking to the bottom of your bag. Most children enjoy raisins and they are reasonably healthy snack (in small doses), as they contain various vitamins and minerals, as well as being naturally high in fibre. They can also be really good for keeping the little one occupied for short amounts of time, as they have to really concentrate on using their pincer grip. 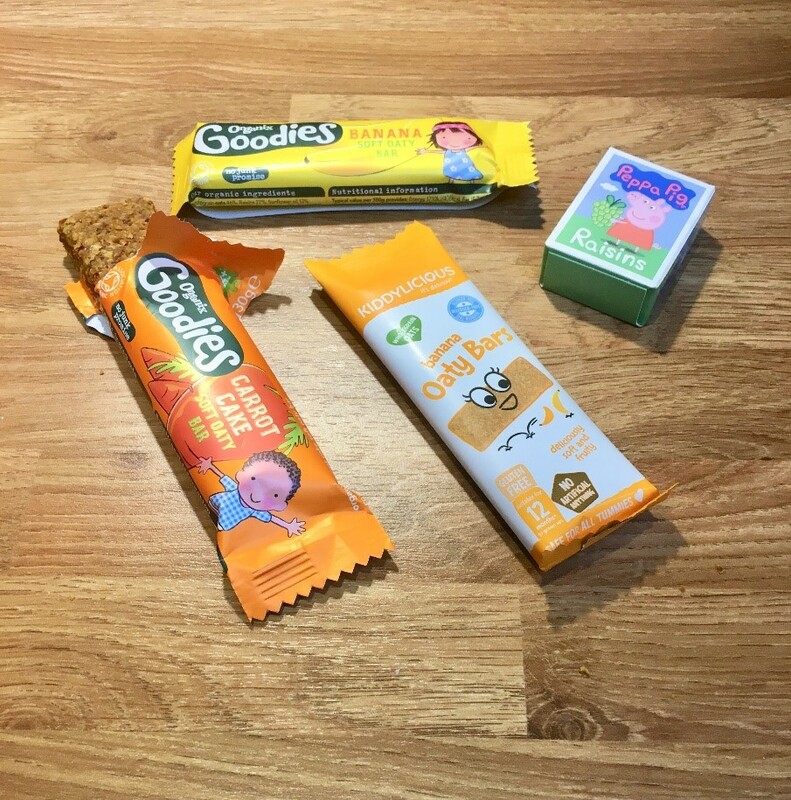 These are our go to snack when the little one is hungry during the day, as they are easy to have when you’re out and about. 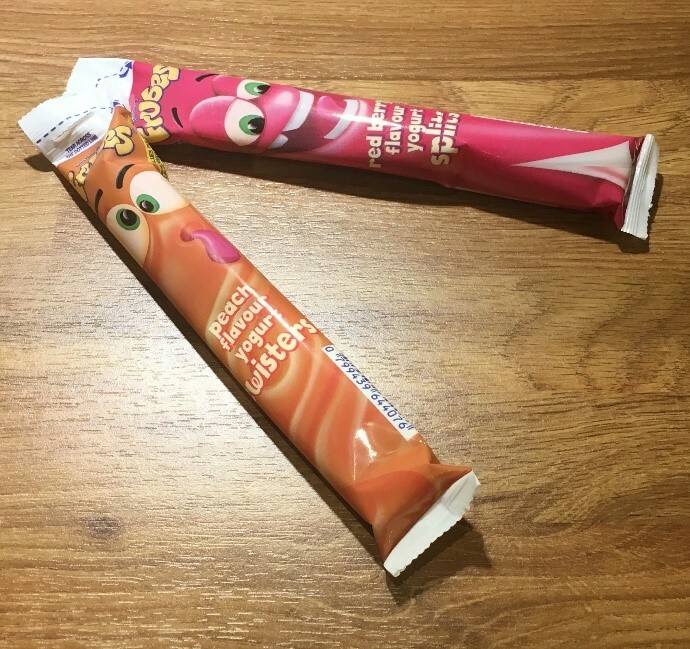 If you have a younger toddler, you may find these to be quite messy as they can be slightly crumbly. You can get different flavours, but our little testers favourites are definitely the carrot cake and banana cake ones. 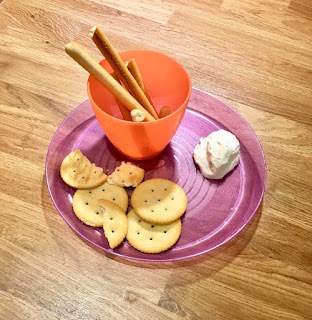 We recently found the little one liked this snack at a family party, and so much so he ended up eating most of the breadsticks and a good portion of the dip. For a snack, I just give him a couple of breadsticks broken up and a little dollop of cream cheese, or if you are feeling more adventurous you could try hummus. For on the go you could use Dairylea Dunkers. 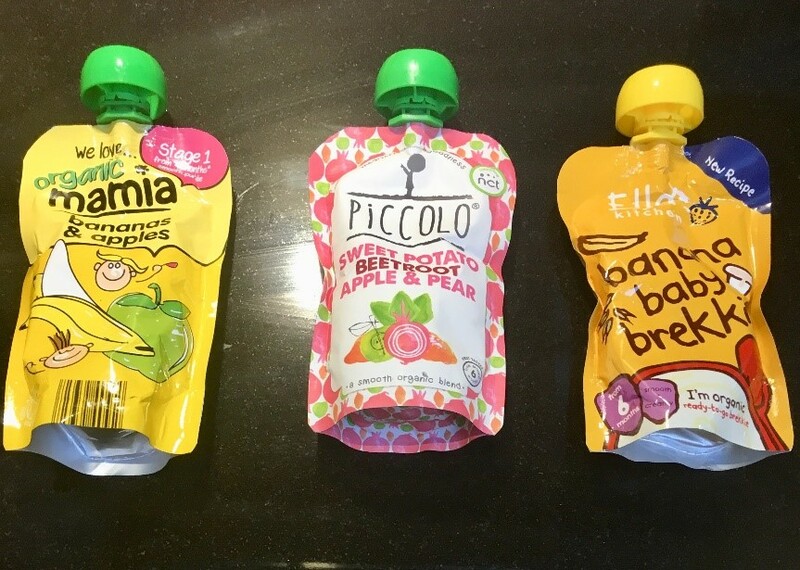 If you have a little more time, a really good snack which can easily fill up your toddler is toast, it is something which can easily be varied to suit your toddler’s wants/needs. For example, you can spread different toppings on or you can use cookie cutters to make different shapes. The first time I did this for the little one, he absolutely loved it and ate two full slices of toast. I’ve found that sometimes making the foods look more attractive, can entice the little one to eat it (this doesn’t always work, however). 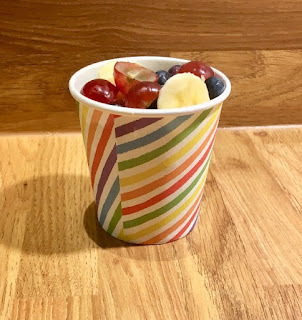 One thing I’ve tried recently is making fruit pots and they seem to work in encouraging the little tester to eat some fruit. 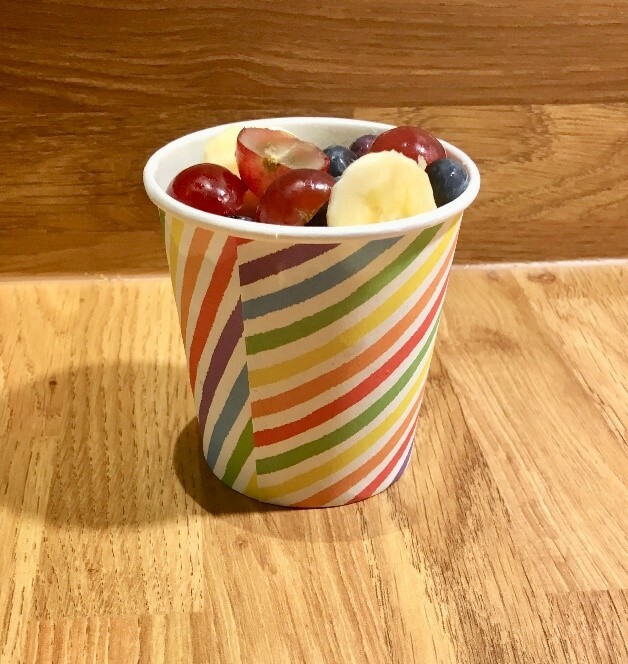 Maybe mixing in some different fruits with ones you know your child is going to eat could encourage them to try something different. Just remember to cut grapes length ways to prevent choking. 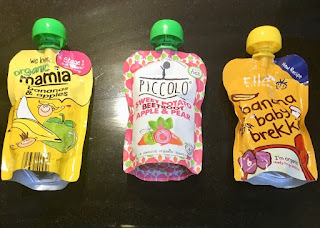 I know fruit/veg pouches are normally used for weaning babies, but they can be a very good way of sneaking fruits and vegetables into your toddler’s diet. They are also really easy and convenient to pop into your changing bag. Plain popcorn can be a good snack, as it’s heathy and can quickly fill up a hungry toddler. You can also buy small packets of lightly flavoured, toddler friendly popcorn (without the kernels) which make it easier to give on the go, as you don’t have to worry too much about the choking hazard. Most toddlers do enjoy yogurts, our little tester is not really all that bothered with them, but he does likes them more now than when he was a baby. Frubes are good to have on the go, but I would sit armed with a wipe just in case it’s squeezed a little too hard. You can also put frubes in the freezer, to either cool your toddler down in the summer or help with teething pain. Mini sandwiches are our go to lunchtime food, as they can easily be taken out and you know that they are eating something substantial. Our little tester’s favourite fillings are either cream cheese or ham, but you can put various fillings in such as, tuna, turkey, cheese or chicken. 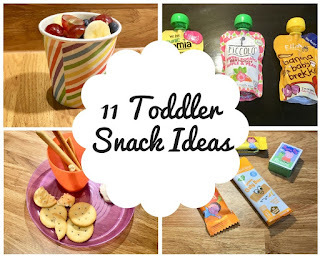 I hope you these snack ideas help you in the journey of finding something your toddler will actually eat. What is your go to snack and what is your little ones favourite thing to eat?